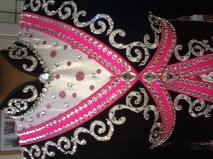 Stunning Siopa Rince dress – will suit tall under 15-16 championship/preliminary dancer. The dress is in excellent condition, kept in a smoke and pet free home, with no tan or make up marks. It is only 1 year old and unfortunately my daughter has grown out of it. 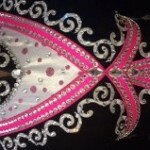 Absolutely stunning on stage and will compliment any dancer. Made by Siopa Rince, it is black velvet with shocking pink piping and the main dress fabric is white satin with a fine netting over the top with sparkling pink spots. The whole dress is covered in 100s of swarvoski crystals.